In honor of Black History Month, watch short films based on award willing children's books about people who changed the world through their courageous actions. Sit back, relax, and enjoy the show! This free program is sponsored by the Friends of the Pittsburg Library. For special accommodations, please contact the Library with 72 hours notice. Join us for a night of cooking with family with Chef David Smith of Kid Creole Soul Food Restaurant in Oakland. He’ll teach us to combine fresh, delicious ingredients which can connect us with African American culture and feed our souls! All ingredients and cooking utensils will be provided and we'll sample our own cooking at the close of class! Registration required. Ages 5-adult. Children under the age of 12 must be accompanied by parents. 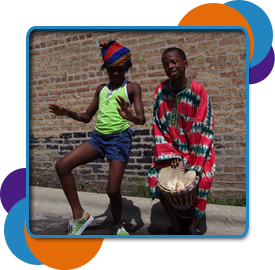 Our Loco Bloco drum workshop will focus on the community aspect of carnaval. Participants will learn LB original compositions rooted in Afro-Latin diaspora percussion, common rhythms played in carnaval in the Caribbean and the Americas and its importance culturally. With an emphasis on the "Bloco" philosophy: a street/neighborhood/block culture that was born out of resistance and a fight for Black Brazilians' participation in carnaval. Please register now and join El Cerrito Library for a fantastic Black History Month experience for the whole family! Please join us as local award winning filmmaker Eva A. Ma shows her film "The Artist in Society" which is about a local, East Bay artist named Hershell West who has been president of the board of directors of both the Richmond Art Center and ProArts in Oakland. Black History Month Film Week: Whose Streets? Whose Streets? is an unflinching look at how the killing of 18-year-old Mike Brown inspired a community to fight back and sparked a global movement. Rated R. 1h 30m. Footage shot by a group of Swedish journalists documenting the Black Power Movement in the United States is edited together by a contemporary Swedish filmmaker. Not Rated. 1h 40m. A fascinating chronicle of hip-hop, urban fashion, and the hustle that brought oversized pants and graffiti-drenched jackets from Orchard Street to high fashion's catwalks and Middle America shopping malls. Director Sacha Jenkins' music-drenched history draws from a rich mix of archival materials and in-depth interviews with rappers, designers, and other industry insiders.